What does ‘brand success’ mean to you? Do you want to stir pride in folks when they see your logo? Maybe it’s getting some good press or social media buzz. Or, on a broader scale, you probably want to chosen by residents, businesses and visitors, instead of neighboring and competing communities. Whatever goals you have in mind, you can’t achieve them without building and stewarding a strong civic brand identity. More than a logo, your brand is the heart and soul of your community. It represents the emotional connections and experiences people have with you and, ultimately, sparks your economic value. On the other hand, your brand can also be a serious liability if it’s mismanaged. From using the wrong logo to a lack of messaging consistency, a poorly executed brand can cause serious confusion and chaos, not to mention frustrated taxpayers. Good brand management requires you to enforce strict, consistent brand guidelines while adapting to your audience’s dynamic needs. It’s an evolution – a perpetual, ongoing process that takes years of work, money and, sometimes, small tweaks. Even billion-dollar corporations struggle with how to manage their brand all of the time. It’s especially difficult for civic-based organizations. Unlike large companies that have the luxury of a multi-person marketing department, cities and communities sometimes have one (if they’re lucky) person responsible for marketing and communications. 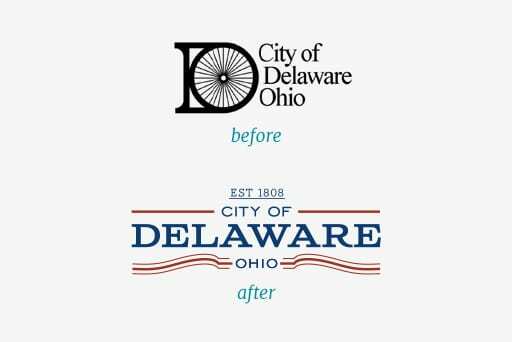 When City of Delaware rebranded, they relied on everyone for support, from the mayor and city council to administrative staff and volunteers. Letting brand materials grow stale; not paying attention to it on a consistent basis. Some of these issues can be one-time accidents. However, left unchecked, they can quickly transform into serial problems. It’s important to have one or two people lead the brand for decision-making purposes, but you can drive yourself crazy patrolling the brand solo. It’s not a one-person job. By handing out more brand police badges, you can get way more accomplished. Here is our step-by-step guide for helping fellow civic brand cops follow and enforce the brand laws. Step 1: Develop and train on brand standards. Your civic brand identity and standards go hand-in-hand. Beyond basic design principles for your logo, your standards explain the most important tenets of your brand: core values, positioning, tone and voice. It also includes guidelines for collateral, signage and marketing channels. While it takes time to develop this resource, it ensures good brand representation across everything you do. Most importantly, it removes personal bias from brand management. The library — whether housed virtually or on a zip drive — protects against people asking you for files all of the time and, most importantly, it deters them from manipulating brand elements themselves. Step 3: Recruit and train your brand team. Whether you call them brand ambassadors, champions, advocates, stewards etc., you need to educate and empower anyone who creates brand-related content. This includes your employees (including anyone who reviews or approves content like the mayor, city council, legal, HR, etc. ), volunteers, agency partners and consultants. As the walking, talking billboards of your organization, they need to be given the autonomy to incorporate the brand into their daily tasks. Plus, they’ll lift some weight off of your shoulders. You can build buy-in by hosting an exclusive brand seminar where you offer pointers for how to use your brand asset library. Walk them through specific examples, showing them how to use the brand in speeches, press releases, letters, emails and the website. In addition to this big event, provide regular touch points to maintain consistency. You can also provide important brand updates, train new employees and gather feedback. Step 4: Be consistent. It’s easy to be enthusiastic at brand launch. Like a new haircut, everyone loves a fresh, clean look. But after time, excitement fades and you get a little bored. Soon enough, you’re ready for something new. While small brand refreshes or expansions are good every now and then, you shouldn’t have to correct past mistakes or increase interest, assuming you have a solid brand foundation to begin with. A good civic brand is one that you and your colleagues want to protect and deliver upon every single day. If you all give it consistent love and care, not only will you be honoring your brand promise, but you’ll build and maintain loyalty for many years to come. Was this helpful? At Guide Studio, we believe in the power of thoughtful brand management. If you’ve recently branded or are about to embark on the process, download this Brand Champion Guide for step-by-step instructions on how to build a team of successful brand advocates.